While adult palms were being imported from abroad, a rain of seeds fell on the Palmetum. It was the result of our expeditions as well as the product of our network of contacts with other botanical gardens specialised in tropical flora. Through the years many packets arrived from countries as diverse as New Caledonia, Hawaii, Brazil, Cuba, Florida, Australia, Indonesia and the Dominican Republic. The reproduction greenhouse contained more than 700 plant species and a million tags. Some plants were purposely excluded from the collection: those that could produce hybrids with the only native palm, Phoenix canariensis , and those species, of any family, that could escape from cultivation to become invasive weeds. The collection was evaluated in 1999 by a British survey. Its purpose was to screen all the public palm collections in the world for BGCI: Botanic Gardens Conservation International. 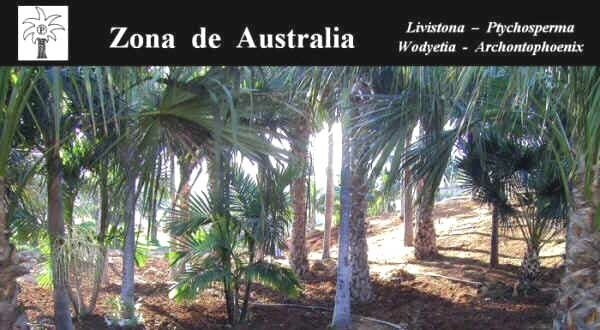 The Palmetum, with data of late 1998 classified as the fifth largest public palm collection. It was unique in having six unique species which were not represented anywhere else. The hard years that followed 1999 mutilated that collection which still deserves interest. What Is Left Of The Collection In 2005 ? 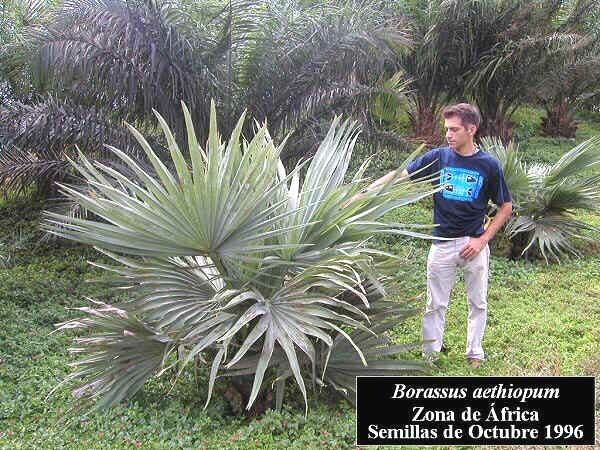 Species data bases show that in 1999 the Palmetum had 410 palm species represented by some 5000 individual plants. Nevertheless during the year 2000 many of them disappeared as the snow under the sun. The end of money caused the end of many tropical delicacies, such as Verschaffeltia, Marojejya and Roscheria , all were doing well until water failed. Beautiful young Nypa and Mauritia died, as well as the rare Attalea crassispatha , Carpoxylon macrospermum and the recently discovered Coccothrinax boschiana . Today the list of species is much shorter and includes about 310 species. Palms had really hard times during the first years. They had to recover from transplant shock on the top of the desert hill: setbacks seemed eternal. Today the environment is much more suitable for palms and a spectacular growth is going on. The year 2003 was the one that brought us new hope: like a miracle, many of the species that had got through the hard years of establishment started to grow much master than before. Most species were planted in groups in order to form natural populations reminding the way they occur in the true wilderness. As years passed, plants borne from seeds gave excellent results, so that many of them are now larger and stronger than the ones imported as adult specimens. It hosts and immense diversity of palms, some of them grew through its dome: leaves of Caryota no are so large that can be seen from the highway, 2 km away. There are two adult fruiting specimens of Areca catechu and one of Areca macrocalyx . Three Beccariophoenix madagascariensis grow steadily just like two splendid Pelagodoxa henryana which came from seeds collected in Vanuatu. Other eye catchers are two adult Archontophoenix purpurea , with flat leaves and purple-bluish crownshafts. The tropical Bentickia nicobarica bloomed for the first time in early 2004 but it died in January 2005 for lack of water. Luckily another healthy specimen lives outdoors. There are different species of Licuala and Cryosophila and some juveniles of Arenga undulatifolia and Schippia concolor .The main pillar that sustains the dome is used to support the climbing palm Daemonorops cf. jenkinsiana which is already majestic. Another climbing species, Desmoncus ortacanthos , bloomed for the first time in April 2004. A 3m tall Astrocaryum standleyanum shows its armour to the few lucky visitors and a few steps away there are two young trunking Heterospathe elata and an adult Aiphanes . Many Areca triandra and Pinanga coronata fruit regularly. There is also a juvenile of Ptychococcus lepidotus and a curious Bactris major var. infesta that has produced some stems with variegated leaves. 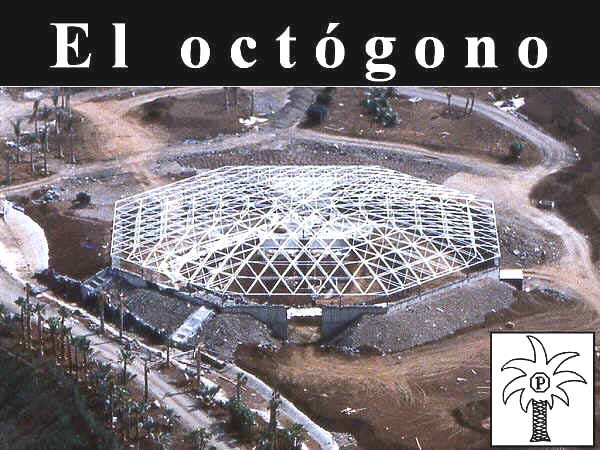 The collection of Chamaedorea was toasted in 2001 when wind blew away the shading cloth of the octagon. Today few good specimens are surviving and they belong to the species Chamaedorea cataractarum , C. nationsiana and C. brachypoda . Survivors of other species are struggling against sun in really bad conditions. This section grows along the longest and straightest portion of the stream. The best South American surprise was doubtlessly the group of Syagrus botryophora . Three young plants were donated by the Montgomery Botanical Center of Miami and were planted in the ground in April 1999: since then these novelties produced about 2 m of trunk per year. In early 2004 they were about 7 m tall and they started to bloom. Now they are growing slowlier but they are increasing their bases in girth. Some other species of Syagrus and two small 2 m tall Attalea grow in the area. There are various adult fruiting specimens of Copernicia alba , Trithrinax acathocoma , T. campestris and Allagoptera . Four trunkless Polyandrococos caudescens , grow effortlessly on the slopes of the octagon surrounded by a population of adult Syagrus schizophylla . In the year 2000 we planted three species of Ceroxylon in a cooler spot and one of them is still alive and good looking. The other two died for too much dry warmth, like many of the Trachycarpus fortunei that were planted in the earliest years. The last delicacies in this area are two specimens of the new Syagrus vermicularis : this species was described as recently as September 2004 by Dr. Larry Noblick, who sent us the young plants in 1998. It contains the richest collection of the Palmetum and one of the world most complete collections of the genus Coccothrinax with about 40 species. Among them, the largest are C. proctorii , C. spissa and C. crinita . Almost all the West Indian palms gave good results: different species of Copernicia boost splendid sculptural leaves. C. berteroana and C. hospita are fruiting regularly and four imposing specimens of C. baileyana tower in the centre of the area: the largest attains 4 m but has no trunk yet. One of two Copernicia ekmanii survived now it is 1.40 m tall and its leaves are as white as they have to be. The group of Gaussia princeps has 11 individuals and some of them are already trunking. They grew from seeds we collected in the wild in late 1996. Three healthy Acrocomia quisqueyana , attain 3.5 m in height. They were seedlings in 1997, donated by the Botanic Gardens of Santo Domingo. Two Pseudophoenix sargentii fruit since 2004 and one of the two Zombia antillarum already has a 1 m tall trunk. Various specimens of Syagrus amara are starting their trunk: it is the only palm species endemic to the Lesser Antilles. The largest palms of this section are surely Roystonea regia , Sabal palmetto , Acoelorraphe wrightii , Cocos nucifera , which form huge masses with trunks of various meters. The most precious pearls of our Caribbean are the small Thrinax ekmaniana and Thrinax compacta : show Cuban beauties which are just 20 cm tall at six years of age. Two Cuban belly palms, Gastrococos crispa , have produced their 3 m tall trunks in less than two years. Few African species exist and fewer are represented in our collection, but the two Raphia australis alone would deserve the whole visit to the Palmetum. Between the years 2001 and 2003 they grew from a height of just 2 m to an impressive 7 m. Their exceedingly long leaves show brightly coloured orange rachises. Various young Borassus aethiopum grow slowly but their leaves already attain 2,5 m. A shy Jubaeopsis caffra flowered for the first time in 2004. Dozens of Elaeis guineensis bloom and fruit since summer 2000. We hope that the Palmetum will come to a new life in order to plant in the ground the plants Hyphaene and Medemia which are silently waiting in their pots together with many other species. It is the youngest space as it was planted at the end of the year 2000. We were surprised by the speed of growth of the Hawaiian Pritchardia . There are four species planted in natural groups and Pritchardia minor is the most attractive; so different from the other species, having small leaves loaded with white tomentum. Four Kentiopsis oliviformis and many Chambeyronia macrocarpa are getting stronger and producing trunks in the special section for New Caledonia, together with a trunkless individual of Burretiokentia . The area is dominated by many Wodyetia bifurcata , which bloomed in 2004 for the first time and by tall specimens of Livistona australis which grew at the impressive rate of 1,5 m of trunk per year and produce seeds regularly since 2003. There are different species of Ptychosperma , Livistona and Archontophoenix , two trunkless Corypha utan and one fruiting Carpentaria acuminata . One Normambya lives or survives alone in a pot. In December 2004 it unfolded its first flowers. Five Arenga pinnata are producing the first grand sized leaves (now >5 m long). A dense hedge of Arenga engleri produces fruits since 2004 and three trunkless Corypha umbraculifera have started to grow steadily. We all dream to live long enough to see them bloom and die. These palms, alter a long life "commit suicide" in the name of reproduction. Five Wallichia disticha show perfect fans. The group of three Adonidia merrillii (formerly Veitchia ), being often covered by white flies, explain us why they are so uncommon in the Canary Islands. One Bentickia nicobarica , one Arenga porphyrocarpa and one Areca triandra are now thriving after an unlucky start on the formerly desert empty mountaintop. Also Livistona saribus , L. rotundifolia and Licuala spinosa seem to have solved their problems. This small space hosts perfect fruiting specimens of Hyophorbe , Latania and Dictyosperma . The only specimen of Acantophoenix died in Summer 2004. It contains a quite poor collection, probably consisting of less than 20 species - nothing compared to the palm diversity existing in Madagascar. Nevertheless the imposing sight of the immense group of blue Bismarckia nobilis is probably the most majestic of the whole Palmetum. All the palm lovers stop there for a rest to be delighted by their beauty. Blooming started in 2003 but only male specimens produced inflorescences. The following year females joined and in autumn 2004 the first viable fruits were ready. A few steps away, on the same lawn many clumping Dypsis cabadae fruit since mid 2004. Specimens of Dypsis leptocheilos and D. lastelliana have just started to flower. A promising Ravenea glauca survived to the bad luck prosecuting the Palmetum and now has a healthy appearance. All plants are young as this section was planted in April 2000. There are two Sabal mauritiiformis , many S. mexicana and one S. yapa , different species of Brahea , one Attalea cohune and a juvenile Coccothrinax readii : the only Mexican species of this genus which is otherwise typically insular. Even though just one palm species is native to the archipelago, we decided to dedicate a whole area to Phoenix canariensis . Together with many palms of this species, this section hosts plants that used to live in the Canarian Termophilous Scrublands: an almost extinct ecosystem. The palm, together with the dragon tree was the most eye catching element of this vegetation type. The genera now present in this zone are Apollonias, Dracaena, Phoenix, Euphorbia, Echium, Marcetella, Lotus and Argyranthemum . Many more should be added to complete this area which wants to be an environmental reconstruction. The collection includes hundreds of species from other plant families. They are maintained for their conservational or educational value or to give a floristic context to palms by creating realistic environmental reconstructions, designed to reproduce natural palm habitats. There is a rich collection of uncommon species of Agave , Consolea , Ficus , Pandanus , Plumeria , Araceae and Bromeliaceae. Many shrub and tree species from Cuba and New Caledonia are grown. There is a 3.5m tall individual of a probably new species of Consolea , which is still waiting to be studied and described. Another Dominican rarity is the specimen of Clavija domingensis . 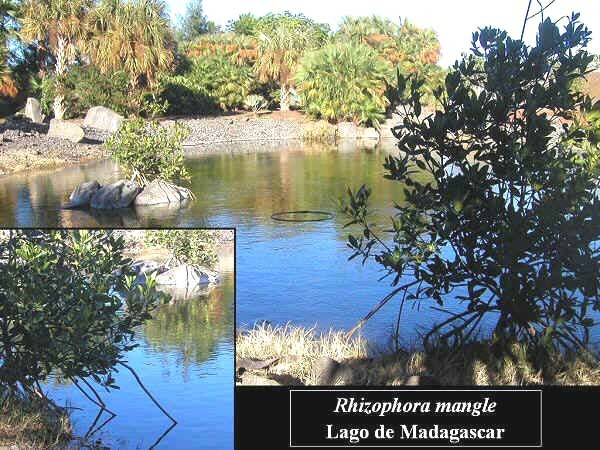 Adult specimens of mangroves, Rhizophora mangle , act as people-stoppers. They are planted in the main lake and are already lying on their typical stilt-roots and producing their curious torpedo-shaped floating fruits. More common, yet worthy to be mentioned are: a majestic Ficus religiosa which has surpassed 10m in height; a typical Caribbean coastal forest, close to the main waterfall; three specimens of breadfruit, Artocarpus camansi , thriving well in the Pacific Island section. Three baobabs which germinated in 1996 in our greenhouse rapidly grew to perfection: two of them are Adansonia digitata , from Gambia and one is A. grandidieri , from Madagascar. In the octagon there is a cacao plant which has produced fruits with viable seeds since 2003. During the year 2003, while we were admiring the growing explosion of growth and blooming, we started to notice that something weird and new was growing beyond the wind screens. An imposing silhouette was stacking on the sky, framed by the royal palms of the Caribbean zone. The last pieces were being mounted of a new skyscraper which has been built close to the Palmetum. Our park was created to serve to the future expansion of Santa Cruz toward the South. The city, as well as the palms, grew fast during the years of the paralysis and it had eventually reached the mountain, which now was strategically emplaced between the ocean and a new centre of the city, characterised by two large extravagant buildings designed by the Spanish architect Santiago Calatrava: the auditorium and the convention centre. What once was an abandoned paradise in the outskirts of Santa Cruz is now located in the full centre of the city. Since summer 2004 we see how the new buildings are being populated. We believe that the new neighbours will see from their flats the shape of the octagon, will observe the palms with binoculars and will ask themselves when they will eventually be able to visit this secret botanical garden.